Guild of Harmony makes some pretty cool and unique figures. Their latest are a Steampunk Alice and Clockwork Rabbit, now up on their website. 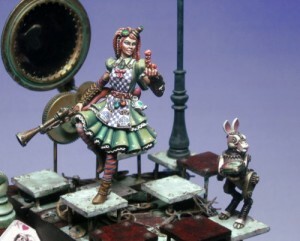 The next Guild of Harmony steampunk figure has hit the virtual shelves: Steampunk Alice and her Clockwork Rabbit. This 32mm set is now available as a limited edition resin at the Guild of Harmony online store. Each copy comes with a hand-signed and numbered certificate of authenticity.